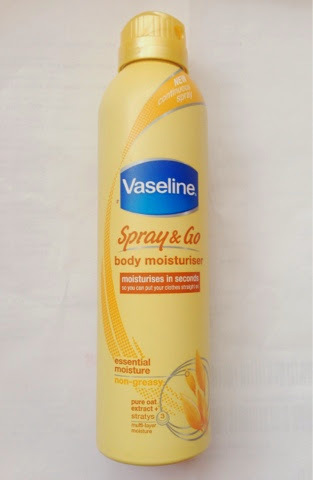 Spray and go moisturises your body in seconds, it claims you can put your clothes on straight away and off you go! It also claims to be non greasy and to leave your skin feeling soft and smooth...so is it all true and does it live up to my expectations? I have been using this product for the last two weeks and I have already brought my second bottle as it has really worked for me! As summer is approaching I have started to exfoliate my skin a lot more and I am trying to make it in to a daily habit to moisturise after my shower routine so my skin looks all lovely dovely for summer! I particularly like spray and go because it is really convenient. It has a twist and lock cap so you know no product will just leak out. The spray really helps to get those awkward places as you can also spray upside down. It helps to reach places like your shoulder and back easily without having to extra stretch your arms! It absorbs into the skin really quickly so you do not have to wait to put your clothes on! Which is what I love about this product. I am a person who has no patience. I do not have the time to wait around for my moisturiser to sink in just so I can put my clothes on so this product really does live up to its claim. It leaves no greasy feeling or any residue behind on my clothes. This moisturiser is very light so if you have extreme dry skin maybe use something heavier as well. 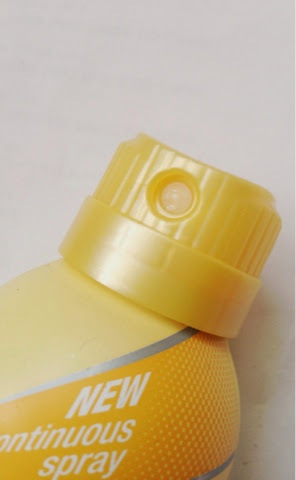 I can see this product being really popular over the upcoming summer months as it leaves a lovely cool feeling when sprayed on to the skin which is a nice bonus! So do I think it makes my skin feel soft? Well of course yes because it really does! This moisturiser has really helped my skin to feel great and soft. My skin is normally classed as dry, it always has been and I always get comments from family members why my skin is peeling off! But since using this and in conjunction with regular exfoliating my skin has never felt better. Can be brought from Boots. I really like this but still continue to use a body butter once a week to make sure my legs are as moisturised as possible. Thanks for the idea I might start using one too! I need to take care of my legs a bit more this seems to do its job but there's no harm in adding more! I've been wanting to try this for a while and your blog has nipped it in the bud! The next time I go shopping I'm going to buy this! Just wondering, what skin type are you? I have dry skin and I'm wondering if it will be moisturising enough!! I came from the bbloggers blog hop! If you could check out my blog and give me some advice, that would be great! If you have extreme dry skin I would say use this but also use something else on top of it or something heavier like Shea/cocoa butter once or twice a week. I have dry skin and this seems to be fine for me however I will add something else as I want my legs looking great for the summer! I love the idea of this product, I hate waiting around for moisutisers to dry so I think i'll be investing in this sometime in the near future!